We often deal with many clients who come to us to help them sell a collection of furniture and home accents that may be necessitated by retirement, relocation or combining households. We have had a few estate executors contact us to help with the complete liquidation of the contents of a relative's home. In the past, we were only interested in bringing in items that we would like to offer for re-sale in our store, but often took the whole collection of items for sale as a help to our clients. Some of these items are hard to sell in our store as they do not fit our previous business model. We have found that these mainly newer items can be brokered to third parties for sale to their clientele. Liquidating an estate is a great challenge for our clients. We offer our expertise and have a few models we can adopt to help effectively manage estate sales, including closed bid auction, nationally featured auction for fine antiques and works of art. We have our own professional photography services and accounts on all the most popular auction sites with many years of experience selling items internationally and accounts to manage shipping and freighting. Some options include private liquidation, estate sale on location and international auctions through professional auction houses. Through on-site estate sales we can increase sale proceeds immediately (versus in-store consignment) and we will relieve our clients of the inconveniences of detailed planning and follow through with the implementation of the sale. Estate Sale Management conducted by our professionals will not only save you time and money, but will also take a tremendous burden off you and your family at what is usually a difficult time. We bring our years knowledge of antiques and vintage retail and wholesale research and estimation for quality and pricing know how to make the process easier for you and at the same time maximize the return on the estate. We are offering a complete service, from estimates, cataloging, sale, through clean-out. It'll be sunny (we hope)! Temp 3111. 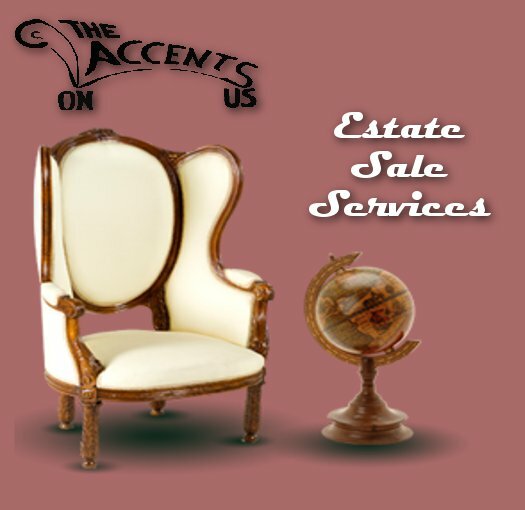 We offer pickup/delivery for both our estate clients and customers who purchase large items at the estate sale with a licensed private delivery company. Listed by The Accents On Us Last modified 1 Hour ago. 99 Pictures Total. Listed by The Accents On Us Last modified 1 Day ago. 68 Pictures Total. Listed by The Accents On Us Last modified 2 Days ago. 73 Pictures Total.